Authors’ note: We were lucky to have access to the extensive photographic archives of the University of Louisville and the Library of Congress. We are grateful to the University of Kentucky and Boston Public Library for sharing their postcard collections. We also thank Louisville photographer, John Nation, as well as Bim Deitrich, Susan Seiller, Laura Leong, Lee Luvisi, Kathy Cary, Denis Kitchen, Nancy Shepherd and Alan Rupp, for sharing their photographs and restaurant memorabilia. Kolb’s, where baseball’s National League was formed (p. 14): R 08629 00, Royal Photo Company Collection, Photographic Archives, University of Louisville, Louisville, KY.
Bauer’s patio (p. 16): John Nation. Bauer’s sign (color insert): John Nation. The third Cuscaden’s Happyland (p. 20): CS 083567, Caulfield & Shook Collection, Photographic Archives, University of Louisville, Louisville, KY.
Mazzoni’s, home of the rolled oyster (p. 22): John Nation. Mazzoni’s-style rolled oysters (color insert): Michelle Turner. Vienna Restaurant, 1970s (p. 26): HABS KY, 56-LOUVI,24-, Vienna Restaurant, 133-135 South Fourth Street, Louisville, Jefferson County, KY, Historic American Buildings Survey, Prints and Photographs Division, Library of Congress, Washington, DC. Vienna Building, 1970s (color insert): HABS KY, 56-LOUVI,24-, West (Front) Elevation, From Northwest, Vienna Restaurant, 133-135 South Fourth Street, Louisville, Jefferson County, KY, Historic American Buildings Survey, Prints and Photographs Division, Library of Congress, Washington, DC. Site of Miller’s Cafeteria (p. 29): Michelle Turner. Benedict’s, circa 1924 (p. 33): P 03242, R.G. Potter Collection, Photographic Archives, University of Louisville, Louisville, KY.
Jennie Benedict-style luncheon rolls (color insert): Michelle Turner. Jennie Benedict’s grave, Cave Hill (color insert): Michelle Turner. Senning’s Park postcard (p. 37): P 05209, R.G. Potter Collection, Photographic Archives, University of Louisville, Louisville, KY.
Kunz’s, with its “quaint Dutch motif” (p. 39): CS 013545, Caulfield & Shook Collection, Photographic Archives, University of Louisville, Louisville, KY.
J. Kunz & Co.’s the Dutchman, at 619 South Fourth Street, with a picture of Jacob Kunz (p. 40): CS 182868, Caulfield & Shook Collection, Photographic Archives, University of Louisville, Louisville, KY.
Kunz’s, 1949 (p. 40): R 11153, Royal Photo Company Collection, Photographic Archives, University of Louisville, Louisville, KY.
Kunz’s the Dutchman, 526 South Fourth Street, 1960s (p. 41): P 00745, R.G. Potter Collection, Photographic Archives, University of Louisville, Louisville, KY. The Starks Building stairway to the Colonnade Cafeteria (p. 45): CS A 1338 1, Photographic Archives, University of Louisville, Louisville, KY.
Cunningham’s, 1926 (p. 49): MSD 024.117, Photographic Archives, University of Louisville, Louisville, KY.
Little Tavern No. 6, looking a lot like White Castle (p. 52): CS 111433, Caulfield & Shook Collection, Photographic Archives, University of Louisville, Louisville, KY.
China Inn (p. 54): CS 219138, Caulfield & Shook Collection, Photographic Archives, University of Louisville, Louisville, KY.
Canary Cottage in the “old English inn” phase (p. 57): P 03118, R.G. Potter Collection, Photographic Archives, University of Louisville, Louisville, KY.
Ladies lunching at Canary Cottage (p.58): P 03116, R.G. Potter Collection, Photographic Archives, University of Louisville, Louisville, KY.
Site of Canary Cottage (color insert): Michelle Turner. Blue Boar Cafeteria line (p. 61): P 03240, R.G. Potter Collection, Photographic Archives, University of Louisville, Louisville, KY.
Fourth Street postcard, with the Blue Boar Cafeteria on the left, circa 1942 (color insert): 2008ms016, Fourth Ave., Looking North, Postcard Collection, University of Kentucky, Lexington, KY.
Stebbins Grill (p. 67): 05.021.256, Photographic Archives, University of Louisville, Louisville, KY.
Swizzle, 1951 (p. 67): R12479 00, Royal Photo Company Collection, Photographic Archives, University of Louisville, Louisville, KY.
Stebbins Grill postcard (color insert): 2008ms016, Louisville’s Choice For Steaks, Chops and Sea Food, Stebbbins Grill, 412 W. Chestnut Street, Postcard Collection, University of Kentucky, Lexington, KY.
Swizzle postcard (color insert): 89498, Swizzle, Louisville’s popular steak and seafood restaurant, Tichnor Brothers Collection, Print Department, Boston Public Library, Boston, MA. Site of Swizzle (color insert): Michelle Turner. Kaelin’s and St. Agnes School (p. 70): CS 223591, Caulfield & Shook Collection, Photographic Archives, University of Louisville, Louisville, KY.
Kaelin’s sign (color insert): Stephen Hacker. Hasenour’s bar (p. 75): John Nation. Ed Hasenour with his wife and daughter (p. 77): John Nation. Hasenour’s (color insert): John Nation. Luvisi’s, “The Spaghetti Specialist” (p. 81): R 14957, Royal Photo Company Collection, Photographic Archives, University of Louisville, Louisville, KY.
Luvisi’s interior (p. 82): Courtesy of Lee Luvisi. Luvisi’s menu, 1948 (p. 83): Courtesy of Lee Luvisi. 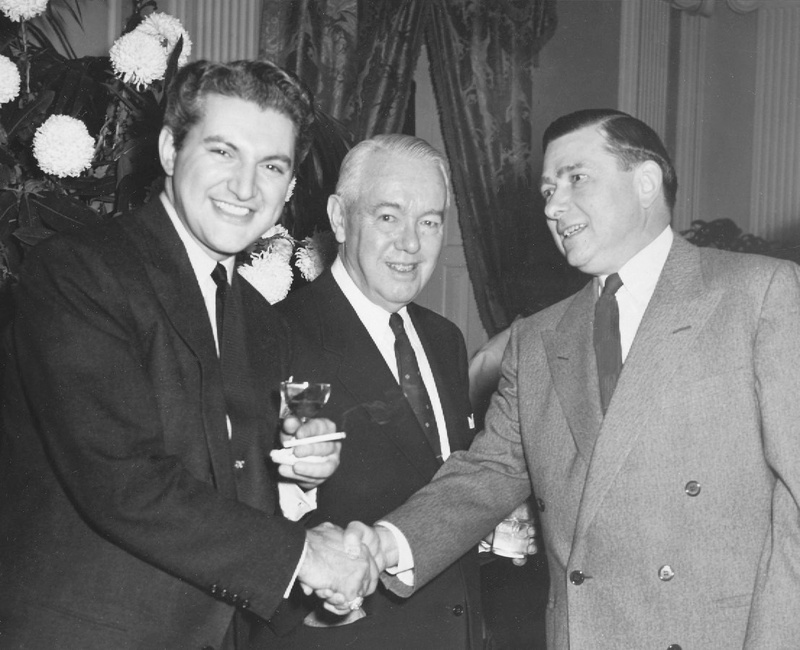 Ernest Luvisi shaking hands with Liberace (p. 84): Courtesy of Lee Luvisi. Kupie Lunch (p. 86): CS 222918, Caulfield & Shook Collection, Photographic Archives, University of Louisville, Louisville, KY.
Plantation at the Seelbach (p. 89): CS 021970, Caulfield & Shook Collection, Photographic Archives, University of Louisville, Louisville, KY.
Leo’s Hideway postcard (p. 92 and color insert): 2008ms016, Leo’s Hideaway“On Huckster’s Row,” Postcard Collection, University of Kentucky, Lexington, KY.
Old House and staff (p. 96): R 11190, Royal Photo Company Collection, Photographic Archives, University of Louisville, Louisville, KY.
Fourth Street, with Stewart’s on right, 1961 (p. 102): R 17662, Royal Photo Company Collection, Photographic Archives, University of Louisville, Louisville, KY.
Stewart’s Cook Book (color insert): Courtesy of Kathy Cary. The only known photo of the C-54 Grill, badly damaged (p. 106): CS 223973, Caulfield & Shook Collection, Photographic Archives, University of Louisville, Louisville, KY.
Hick’s interior (p. 108): CS 234159, Caulfield & Shook Collection, Photographic Archives, University of Louisville, Louisville, KY.
Hick’s postcard (color insert): PC 85.44.7, University of Louisville, Louisville, KY.
Southwind postcard (color insert): 83573, Southwind Drive-In Restaurant, Tichnor Brothers Collection, Print Department, Boston Public Library, Boston, MA. Mr. Kern making pie at the Melrose Inn (p. 110): Courtesy of Alan Rupp. Derby-Pie®, created at the Melrose Inn (color insert): Michelle Turner. Longchamps’ rendering of a L’il Abner’s (p. 114 and color insert): Courtesy of Denis Kitchen. Bowman Field, site of Hoe Kow (p. 117): Michelle Turner. George Leong at Hoe Kow (color insert): Courtesy of Laura Leong. Hoe Kow-style war sui gai (color insert): Michelle Turner. Site of simmons (p. 124): Michelle Turner. Ferd Grisanti’s (p. 128): John Nation. Ferd Grisanti and sons (color insert): John Nation. Jay’s diners (p. 133): John Nation. Jay’s sign (color insert): Michelle Turner. Weissinger-Gaulbert Building, site of Fig Tree (p. 135): Michelle Turner. Site of Sixth Avenue, 600 West Main Street (p. 139): Michelle Turner. Sixth Avenue in its Mexican/Southwest phase (color insert): John Nation. Cafe Metro mural (p. 142): Stephen Hacker. “That is not I. It is Julia.” –Nancy Shepherd (color insert): Stephen Hacker. St. Martin of Tours (p. 147): Michelle Turner. Afro-German Tea Room-style apple crisp (color insert): Michelle Turner. De la Torre’s sign (p. 151): Michelle Turner. Miguel and Maggie de la Torre (color insert): John Nation. De la Torre’s paella (color insert): John Nation. Timothy’s white chili (p. 154): John Nation. Tim Barnes (suited) at Timothy’s with chef James Aydlett (color insert): John Nation. Deitrich’s (p. 157): Bim Deitrich. Deitrich’s interior (color insert): John Nation. Deitrich’s menu (color insert): Courtesy of Bim Deitrich. Deitrich’s exterior (color insert): Bim Deitrich. La Paloma (p. 161): Susan Seiller. Nice list, but….where’s the Pine Room? Alas, we couldn’t find any photos of it. What a legacy to leave – people still talk about their fondest memories of restaurants that were family owned for over 100 years +. Wow! Lots of fun memories, huh? What was the restaurant at Gardner Lane and Bardstown Road.